By Jennifer Hawkins, foreword by Dr. Carolyn Dean M.D., N.D. Simple ways to boost your child’s immune system with food. This book is a compilation of the answers to that question that I learned over the next three years (of almost NO sickness). This is not a book about learning how to cook, goodness knows I’m not the one to teach anyone that. This is not even a book filled with fancy recipes. Instead, this book is intended to show you the path we took to repair our broken health. The American diet is filled with foods that lower immune system functioning leading to a host of physical issues (See forward), and create obesity. Poor health, due to the "American diet", is an epidemic that will most likely cripple the health care industry like nothing else. Not to mention lower our quality of life. 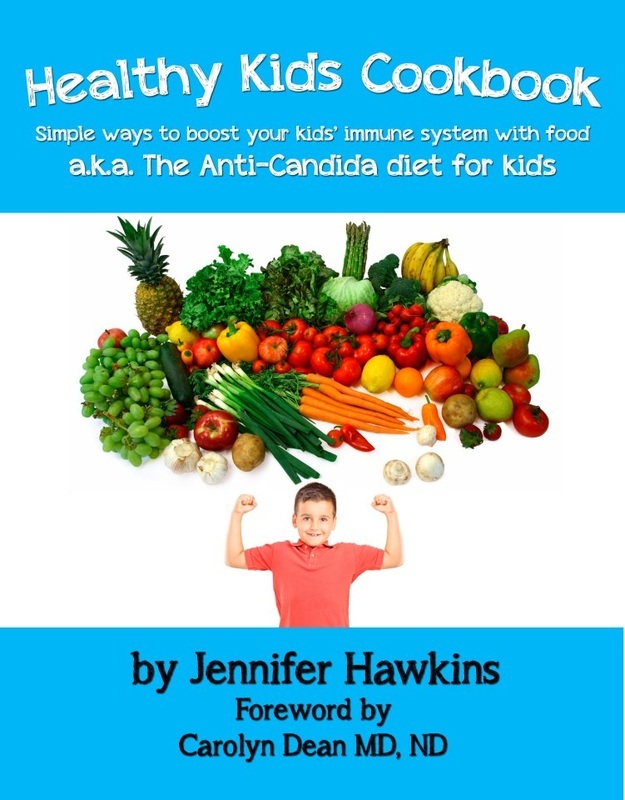 This book will give you easy substitutions for the foods that contribute to your child's (and your) health issues. It will give you ideas you can use to create a diet that’s healthy and right for your family. And finally yes, it will give you some great easy yummy recipes… that my kids like. Get your copy of Healthy Kids Cookbook ! Buy your a Kindle version on Amazon! Dr. Carolyn Dean is a medical doctor and naturopathic doctor in the forefront of the natural medicine revolution since 1979. She has two published patents and is the author/coauthor of 30 health books (print and eBooks) including The Magnesium Miracle, IBS for Dummies, IBS Cookbook for Dummies, The Yeast Connection and Women’s Health, among many others. Dr. Dean is the Medical Director of the non-profit educational site - Nutritional Magnesium Association (www.nutritionalmagnesium.org). Find out more at www.drcarolyndean.com and www.rnadrops22.com. Submit your favorite recipes here! Find other great resources on the Affiliates Page! Follow Healthy Kids on Facebook and Twitter!